What is the best out of the box .45 for bullseye shooting? I only shoot at the club level and only hope to get 270-280 scores. I don't want to do any work to it except maybe a trigger job and mounting a dot to the rail. I've been hearing a lot of good things about the SA range officer. Your opinions would be appriciated. No disrespect meant to anyone, but money clearly can buy you points. No matter how good and consistent your shot process is, if the gun shoots 5" groups at 25 yards you will not score as well as you could. If your wobble doubles group size at 25 yards, you can't even hold 8 ring consistently with a 5" shooter. Bullseye IS an equipment intensive game. Flytrap1-get a Les Baer or Clark with the accuracy verified if you can afford it. DavidR your post gets a big AMEN from me. Years ago I suggested matches with folks using the exact same guns like the old IROC racing where drivers used similarly tuned cars of the same model. This lessens the $$$$$ factor and is more a test of pure skill. I highly recommend the Baer over the Clark pistols. The Baers have minor flaws in fitting in comparison to gross flaws in the Clarks. I regularly work on both brands many times a year and would never recommend a Clark built pistol. There is no comparison. I am currently working on a series 70 Clark that was built in 1981. It is by far the worst Clark I've ever seen. Original owners pistol. A new RO would definitely out shoot it. Wow! Who would have thought a 33 year old pistol worn out already! Jon Eulette wrote: I highly recommend the Baer over the Clark pistols. The Baers have minor flaws in fitting in comparison to gross flaws in the Clarks. I regularly work on both brands many times a year and would never recommend a Clark built pistol. There is no comparison. I am currently working on a series 70 Clark that was built in 1981. It is by far the worst Clark I've ever seen. Original owners pistol. A new RO would definitely out shoot it. I owned a few old clarks and they were ok guns, ive seen several built by Jr. that were crap, I would not buy one at any price if I had to shoot it. Baers are good pistols, of the 25 or so I have ordered for customers and bought myself they were all good solid guns, a couple of the last ones had a less desirable trigger job but that's a easy fix. As far as buying points, Jon, you must have been blessed with something that cant be bought, "talent" that trumps a lot of things that most of us have to work much harder to achieve. Big difference between worn out and not built right in the first place! I've worked on Clark's for over 25 years and have owned them. I would recognize a Clark built gun if you ground the name off the pistol and showed me the parts only. Last year I had a chance to examine, do a trigger job, and shoot a very early Clark longslide .45. It was very nice, but unfortunately most of them aren't even close. You may not be able to buy points. But you can get confidence in equipment that gives you bang for the buck. Confidence will help get points. I'll jump into this to. I could not in good concience recommend a Baer or a Clark. I haven't seen the quality come out of Clarks shop that was there in years past. And Baer, well anyone that tells me to run hardball through my wad gun to break it in, I'll pass. Build it right the first time and you won't have to "break it in". I think the best suggestion as already stated is find another bullseye shooter that is letting go of a backup gun or getting out of the sport. Second best idea would be a Springfield Armory Range Officer, with some trigger work. Or of course get a custom built gun to your specs and you'll be a happy camper for a long time. And if you don't think I know the difference between a Range Officer and a Baer... Review the attached image and ask me which one's go to matches with me. If you can possibly squeeze it in a bullseye specific clinic pays back point score dividends. I've never heard anyone say I purchased too much of a quality pistol, should have gone with the mil-spec instead. But I have seen the mil-spec pistol scores blow right by the $2000 custom. Unless your shooting budget is unlimited, spend your time and money where it pays back in score. Specific training, traveling to matches, Leagues, eating chicken wings with the group after league, all have an impact on your score. This oldy but goodie looks like it would be a nice one to play with. Shoot it as is and add goodies later. Sights wouldn't be EIC legal but you can change sights. Why wouldn't the sights be legal? As a pistolsmith it's easy to look at a given pistol and know that something is wrong with it. And we know we can fix it and make it right. As a pistolsmith it's also feast and famine or our workload. But we always try our best. It's easier during famine and not an excuse, but when Perry is coming up and you have 5 guns going to Perry we might make a mistake that if we had an extra day we wouldn't have overlooked it. We pistolsmith put our neck on the chopping block when we build guns for people who live far away because we can't just make a small tweek at the next gun match. I've been pistol smithing since 1989 and have made some mistakes and I've made corrections. Trigger jobs are all subjective. My idea of a short roll is different than the next guys. I would always hope that someone I built a pistol for that was unhappy with my work would contact me to make it what they desired instead of keeping it to themselves or sharing their unsatisfaction with others. As a pistolsmith I work on many 1911's. Given the choice in a perfect world I would avoid working on a Clark pistol and a Baer because 99% of the time I'm fixing inferior work performed by gunsmiths making a profit from it. Both pistols are pretty, but knowing what a BE pistol should look like on the inside disappoints me. Why? Because you the shooter are typically getting screwed for what you are paying to own one. If a Clark was listed for sale and someone buys it thinking that they are buying a master class pistol they will be truly disappointed by the sad reality of what they just bought. I pistolsmith because I love doing it. Fortunately for me but bad for you, I get to fix/build your pistols for you. I would expect to work on RO that was just boughtfor BE. I shouldn't have to fix barrel springing in your new Baer. I shouldn't have to tell you to send your new Baer back to have a new barrel fit because your bottom barrel lugs are about to shear off your ball gun. So as a gunsmith I'm in a position to think "gee do I tell this guy he just bought a POS, or do I just do the trigger job and give him back his pride and joy"? So being a pistolsmith can be a curse. Not that all pistols are crap that come across our bench, but we do see a large amount of them. So on this forum we share our experience to hopefully educate and prevent future problems for shooters and to learn from you! I've known KC for over two decades and know he is top notch pistolsmith and a gentleman. If I wasn't a pistolsmith I wouldn't hesitate to have him build my match pistols. When I have the skill needed... I'd LOVE to shoot with one of your guns. And as a followup if I send you a piece of crap... No matter the name on it... I want you to tell me! What I'm getting from all these opinions is that there is no definitive "best" .45, just .45's that are best for individual situations. I shoot with a couple of folks that are long time Bullseye shooters. This is about all they shoot so their shooting budget is more concentrated, they have impressive skills and at this point in their learning process the wrong equipment would definitely be a hindrance. They shoot full blown custom .45's and funny looking European .22's, and for them that makes perfect sense. Another is the fellow that doesn't do anything half-way. Budget is not a serious concern and he believes anything but the best is a waste of time. His guns are light years more accurate than he is but he's getting better every day and his custom gun is perfect for him. Most months we have someone show up with their plastic IDPA gun, shoot terrible, hit the berm more than the target, and end up with dismal scores. They don't know where Camp Perry is and aren't completely sure what they do there. They also learn, and have a ball, and sometimes get hooked on the concept of shooting a handgun with precision. For them, at that time, that plastic IDPA gun made sense. I could go on but it seems to me that it's hard to answer "what's the best .45". The better question might be "what is the best .45 for me in this particular situation at this point in my Bullseye journey"
The pistol on the GB site has a Bomar rib. That is not as issued and the pistol would not fit in a service holster. The CMP rules say you can change the sights but cannot add a rib. The good news is if you want to add a dot it is already drilled and tapped in the correct pattern. 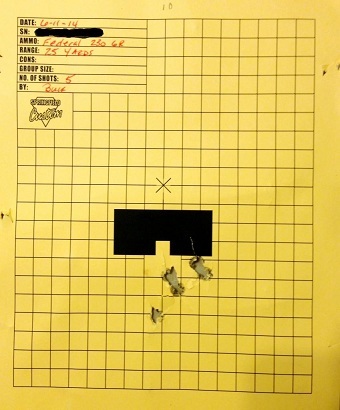 Flytrap1 wrote: What is the best out of the box .45 for bullseye shooting? I only shoot at the club level and only hope to get 270-280 scores. I don't want to do any work to it except maybe a trigger job and mounting a dot to the rail. I've been hearing a lot of good things about the SA range officer. Your opinions would be appriciated. Here's my 2 cents, probably worth 1 cent. I started shooting BE this August at the club level and participated in one 2700. I shoot in the mid 260s with my RO using a Nelson 22 conversion and I think that's a great investment since I wanted to get my scores up before I started using the 45. I've shot 45 4 times and my score is around 245/250 at the moment, using Federal Champion 230gr bulk pack ammunition, but the pistol will shoot around 1.7" at 25 yards from the factory with Federal 230gr bulk hardball. I've shot the occasional 95 on the short line, and high 70s on the long line, just not all at the same time, so the pistol doesn't hold me back, my skill level does, and it can easily put me in the 270+ range, I just have to do my part. The only thing I did for my RO was a bushing and trigger job from Springfield. The trigger job was a waste of money, it's not what I like, but I didn't know that at the time. If you want a BE gun go to a BE gunsmith IMO. I'm lucky and live near several respected BE gunsmiths and after using several other BE shooters pistols I'm able to express what I want and have a hardball gun on order for next year. If I had bought a top end pistol it may have not been the best use of my money. My fundamentals weren't and still aren't there, so the pistol doesn't hold me back. Hopefully next year when my ball gun arrives I'll be ready to shoot near the potential of the pistol with working on my dry fire and 22 prior to its arrival. Big on my list of "To Do" is get a reloader and start making my own ammunition as mentioned to save money, shoot more, and get a bump in accuracy. I have reasons for going ball gun before reloader, which is due to a move to a communist state so I need to have my firearm purchased prior to arrival to be legal, but if that wasn't the case, I would have got the reloader first and just kept plugging away with the RO. The first thing a new shooter needs to answer..."What level of Bullseye Competition am I going to strive for"? Some just want to participate, be part of the "gang", grill and have cook outs after the match.. If this is the case, take your time with $ investments, and have fun.. If you want to be a champion, the next question is, "What am I willing to sacrifice in time, dedication & money.? Because that's what it takes... If you want to strive to be the best, buy the very best equipment ,"now" !! ..and find a good coach.. Not another shooter, a real coach..
An example: A new shooter who was a very poor shot, but had that burning fire to excel, did all of the above.. 4 + years later, is now a Master, one of the best in the country, shooting 880s and 2600s..
How bad do you want it..?? What are your thoughts on training? I'm trying to shoot the .22 two days a week right now and dry fire another 3. In the past 2 months that has moved my NMC scores in practice up to 265 or so. That means that I have plenty of room to improve. My close term goal is to master the .22 and the wadcutter so that I can improve my hardball shooting for EIC. I felt like I had too many issues to resolve and not enough time to just shoot hardball. I'm focusing on irons only and that is working out pretty good. First, I would forget about hardball, and concentrate on 2700s and training. EIC can always come later if you still want it. No one, except you will remember the day that you go distinguished. 2600 + is a far greater accomplishment.. You don't have to be on the range to train. 1000% Focus on the fundamentals.. Scores will follow as fundamentals improve. Dry fire and holding drills can be done almost anywhere, and you don't even need the gun.. Teach your self to focus, concentrate and visualize. It takes work and effort to learn. Then you can train anywhere daily..refuse to compromise on any one of the fundamentals. Thanks Jerry. That is the exact kind of information that I am looking for. I will probably regret this. But I just can't keep my fingers quiet any longer. The thread started with "Whats the best .45" by a Marksman shooter. OK guys there are over 14,000 threads in Equipment, Ammunition and General Discussion on this list. There are only slightly more than 2,000 threads in Fundamentals. Ponder on that for a few moments. Here's my answer. The best .45 you will get is the one you pick out after shooting 280 to 285 MNC's with the .22. At that point you will have learned enough to actually see the sight (or dot) throughout the shot, called all the shots and have some grasp on how to keep sight alignment while having an acceptable sight picture long enough to activate the trigger without screwing up the previous two items. Now, during that time of shooting the .22 only, take all the money you save by not shooting anything but a .22 or dryfiring (you know - all that money that goes to centerfire ammo and do-dad's and 9mm plastic guns and .32 whatevers) and put it in a safe place. Then, when you shoot that 280 to 285 goal, you will have enough money to buy the best .45 and reloader and assorted components. And I'll bet you'll be able to get the maximum benefit from that .45 in less time than you will be trying to do both at the same time. Why? Because above all else a shooter needs to see what it takes to shoot a 10. (And not spend time figuring out what they are doing wrong.) Most shooters do not see what is happening because of the noise, recoil and general anticipation of shooting a centerfire gun. Therefore bad habits develop and have to be corrected. I'll guarantee you'll progress faster.